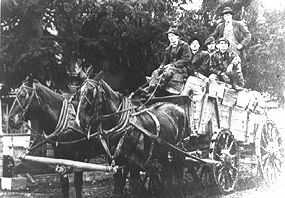 Before trucks became the prime mover of firewood, a horse-drawn wagon was the favored mode of transportation. In this photo, circa 1915, Issaquah residents (from left) Elmer Anderson, Jack Tamborini, Jack Favini, John Favini and John Kranick haul wood that appears to be left over from a local cedar shake cutting operation. It is clear based on the muddy wheels, that the road wasn’t paved at this point.